Over the years, we have colloquially referred to mathematics as a special language. Yet practitioners have had little research to consult on the matter, or impetus to reflect on whether the process of learning the language of mathematics is similar to that of learning any other second language. Although researchers have paid lip service to the unique vocabulary of mathematics, they have done little to highlight the ambiguities, double meanings, and other “word” problems associated with the discipline. Ignorance of these issues can lead to impaired communication at best, and serious mathematical misunderstanding at worst. To compound the difficulty, information in mathematics texts is presented in a bewildering assortment of ways; in attempting to engage students, textbook writers too often introduce graphic distraction, and format the pages in ways that obscure the basic concepts. In this book we look carefully and reflectively at the difficulties inherent in learning the language of mathematics, and suggest strategies for how best to overcome them. There are over 4,000 languages and dialects in the world, and all of them share one thing in common: they have a category for words representing nouns, or objects, and a category for words representing verbs, or actions. Taking this commonality as a starting point provides an interesting way of looking at the mathematical world and its language. It is possible to identify both content and process dimensions in mathematics, but unlike many disciplines, in which process refers to general reasoning and logic skills, in mathematics the term refers to skills that are domain-specific. As a result, people tend to lump content and process together when discussing mathematics, calling it all mathematics content. However, it is vitally important to maintain a distinction between mathematical content and process, because the distinction reflects something very significant about the way humans approach mental activity of any sort. All human languages have grammatical structures that distinguish between nouns and verbs; these structures express the distinction between the objects themselves and the actions carried out by or on the objects. Modeling and formulating. Creating appropriate representations and relationships to mathematize the original problem. Transforming and manipulating. Changing the mathematical form in which a problem is originally expressed to equivalent forms that represent solutions. Inferring. Applying derived results to the original problem situation, and interpreting and generalizing the results in that light. Communicating. Reporting what has been learned about a problem to a specified audience. Taken as a whole, these four actions represent the process that we go through to solve a problem. Taken individually, they represent actions that students can develop and on which they can be assessed. To view the actions individually also enables us to separate the type of proficiency required in, for instance, manipulation and transformation, which are primarily skill-based actions, from the more complex proficiencies required to create a mathematical model and to generalize and extend the results of a mathematical action. Also, because not all exercises make equal demands on or involve equivalent competency in each of the mathematical objects and actions, students will not necessarily perform evenly across them. For example, the ability of learners to model a problem involving functions may be quite different from their ability to model a problem involving data. Students may vary in their abilities to communicate their understanding of geometric objects, and objects of number and quantity. Here again, it is important to keep the distinction between mathematical objects and actions explicit while viewing student work; otherwise, comprehensive assessment of student mathematical understanding will be severely limited. But before we can use mathematical objects to model our surround, we must first acquire them. For many reasons, this is an extremely difficult process. Mathematics truly is a foreign language for most students: it is learned almost entirely at school and is not spoken at home. Mathematics is not a “first” language; that is, it does not originate as a spoken language, except for the naming of small whole numbers. Mathematics has both formal and informal expressions, which we might characterize as “school math” and “street math” (Usiskin, 1996). When we attempt to engage students by using real-world examples, we often find that the colloquial or “street” language does not always map directly or correctly onto the mathematical syntax. For example, suppose a pre-algebra student is asked to symbolically express that there are twice as many dogs as cats in the local animal shelter. The equation 2C=D describes the distribution, but is it true that two cats are equivalent to one dog? Recasting the mathematics domain into objects and actions can also help to illuminate the similarities and differences between how we learn the language of mathematics and how we learn any other second language. My coauthors and I were all viewed as “good in math”—that is, fluent in the mathematics language. As we compared our earliest memories of learning mathematics, one of us remembered being made aware of numbers as an abstract quantity by looking at the pattern of classroom windowpanes. Another, who characterizes herself as a very visual learner, recalled seeing boxes of six pansies apiece packed in cartons of four boxes apiece at her family's floral business—an observation that triggered previously undiscovered ideas about addition and multiplication. Another member of the group, whose father was a banker, remembered dinner-table conversations filled with mental mathematics problems, yet she tends to rely heavily on writing as a learning tool. And one of us told of feeling suddenly “divorced” from the language of mathematics upon entering Algebra II, where everything became symbol-laden and obscure. Despite our varying introductions to and degrees of comfort with mathematical language, my coauthors and I have retained knowledge of the language of mathematics far better than knowledge of the spoken languages we studied. Even though most of us took two or three years of a foreign language in high school, we have not been able to sustain our use of it in any expansive way. Certainly some of this can be explained by our lack of daily use of the languages, but another factor may be at work—namely, the way we learned them, mainly by memorizing vocabulary words and verb conjugations out of any immediate context. Is this not similar to the way students may successfully memorize number facts and plug into algorithms when learning arithmetic? However, when these students are later asked to draw inferences, discriminate between quantities, or justify solutions, the full effect of their lack of mathematics fluency becomes apparent. Another interesting commonality between mathematics and foreign languages lies in the relationship between rhyme and retention. Several in our group either did not initially speak English as a first language, or were essentially bilingual for a period of time in both a “home” language and a “school” language. What we tend to retain of the second language is most easily accessed through music or rhyme—we remember songs, prayers, and poems even though we can no longer perform even the most rudimentary task of written or spoken communication. This brings to mind students who are able to spout mathematical facts using jingles or mnemonics, but cannot use the facts in any extended way or for any new purpose. Perhaps the greatest difficulty in learning the language of mathematics is that a double decoding must go on during the entire process. Particularly in the early stages, we must decode spoken mathematics words in the initial context of normal parlance, and then translate to the different context of mathematics usage. Double decoding also occurs when we first encounter written mathematics words or symbols, which must first be decoded, and then connected to a concept that may or may not be present in prior knowledge even in an elementary way. As developmentally complex as double decoding is for most students, imagine how difficult it must be for second-language learners. The following anecdote illustrates the problem. As I observed a 4th grade classroom, the teacher began by discussing whole numbers; she then moved to the distinction between even and odd numbers. When asked to classify numbers as even or odd, one of the students, a recent Hispanic immigrant with limited English skills, consistently marked the numbers 6 and 10 as odd. When asked to explain, he said, “Those whole numbers are not multiples of 2.” Additional conversation between teacher and student did little to clarify the problem until I asked the student what he meant by “whole numbers.” It was only when he answered “6, 8, 9, 10, and maybe 3” that we realized that this student had constructed a mental model of “hole” numbers—that is, numbers formed by sticks and holes—and that this was, to him, a totally consistent explanation. If a number had only one “hole,” like the numbers 6, 9, and 10, it was odd, because the number of “holes” was not a multiple of 2. The number 3 was problematic in this student's system, because he couldn't decide whether it was really two holes if you completed the image, or two half-holes that could be combined to make a single one. Though this anecdote may seem bizarre, it richly illustrates the difficulty students have as they struggle to make meaning of the words they hear in the mathematics classroom. Another difficulty inherent in the decoding process stems from the fact that, although most mathematical nouns actually describe the things they refer to, their origins are usually Latin or Greek rather than English. The work of Steven Schwartzman (1994) has traced these connections. The mathematics words that we use in English come from many sources, and have assumed their current forms as a result of various processes; in addition, many contain more than one unit of meaning. Even though English, Greek, and Latin are all rooted in the Indo-European language—the common ancestor of the languages spoken by roughly half of the people in the world today—few American students currently have any exposure to either Greek or Latin. An interesting example of how language can either illuminate or obscure concepts is the difference between the word “twelve” in English and the corresponding word in Chinese, the grammar of which is a perfect reflection of decimal structure. One day, as I was observing the piloting of a manipulative device designed to help students understand place value, I talked at length with a Chinese-born teacher who was using the device in his classroom. He told me that in his native language there are only nine names for the numbers 1 through 9, and three multipliers (10, 100, and 1,000). In order to name a number, you read its decomposition in base 10, so that 12 means “ten and two.” This elegant formalism contrasts sharply with the 29 words needed to express the same numbers in English, where, in addition to the words for the numbers 1 through 9, there are special words for the numbers 11 through 19 and the decades from 20 to 90, none of which can be predicted from the words for the other numerals. To compound the confusion, the English word for 12 incorporates two units of meaning: The first part of the word comes from Latin and Greek expressions for “two,” and the second part is related to an Indo-European root meaning “leave” (Wylde & Partridge, 1963). Thus, an etymological decoding would be “the number that leaves 2 behind when 10, the base in which we do our calculating, is subtracted from it”—far from transparent to the novice learner! The confounding potential of symbolic representation cannot be overstated. Younger students can be quite mystified by the fact that changing the orientation of a symbol—for example, from horizontal (=) to vertical (‖)—can completely change its meaning. Figure 1.1 is a collection of confusing words, symbols, and formats that we have encountered in the classroom. This is not an exhaustive list; rather, it is intended as a work-in-progress that teachers are encouraged to add to, and as an early-warning system for educators who are mystified by the misinterpretations particular students may attribute to a mathematical situation that, to others, has quite a different meaning. To summarize, in mathematics, vocabulary may be confusing because the words mean different things in mathematics and nonmathematics contexts, because two different words sound the same, or because more than one word is used to describe the same concept. Symbols may be confusing either because they look alike (e.g., the division and square root symbols) or because different representations may be used to describe the same process (e.g., •, *, and × for multiplication). Graphic representations may be confusing because of formatting variations (e.g., bar graphs versus line graphs) or because the graphics are not consistently read in the same direction. Throughout this book, we will explore how mathematics instruction can be made deeper and more stimulating through skill-building in reading and writing. We will also discuss the importance of graphic representations and classroom discourse. As Barnett-Clarke and Ramirez (2004) note: “As teachers, we must learn to carefully choose the language pathways that support mathematical understanding, and simultaneously, we must be alert for language pitfalls that contribute to misunderstandings of mathematical ideas. 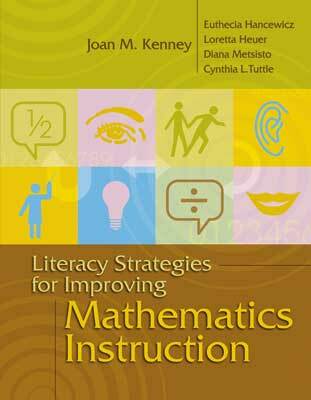 More specifically, we must learn how to invite, support, and model thoughtful explanation, evaluation, and revision of mathematical ideas using correct mathematical terms and symbols” (p. 56). The intent of this book is to facilitate this invitation, this support, and this modeling by opening classroom doors and sharing the wisdom of teachers who have reflected deeply on how best to create and extend the mathematical fluency of their students.